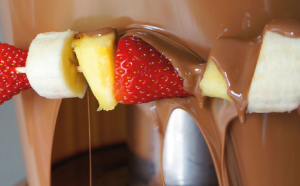 Chocolate fondue fountains are fantastic centrepieces for all occasions including weddings, parties and corporate events. We are a family run Chocolate fountain business and have been trading for nearly 10 years, we use locally sourced food products for freshness and quality, and to help our local economy. 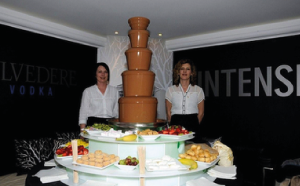 As one of the leading suppliers and rental operators of Chocolate Fountains in the South West , Chocolate Wave has amassed a wealth of experience serving both the general public and corporate clients since 2005. We offer a chocolate fountain hire service covering Devon, Somerset and parts of Cornwall. At Chocolate Wave, we are more than just a chocolate fountain company, we are chocolatiers with a passion for creating the ultimate experience â€“ warm, sensuous and mouth-wateringly pleasurable! Our chocolate fondue fountains provide a visual centrepiece and a room filling luxury aroma to entice you and your guests. If you are looking for a unique and elegant addition to your special occasion, a Chocolate Wave chocolate fountain will be the perfect touch. Chocolate Wave is also a perfect addition to a business promotion, product launch, corporate or charity event. Please have a look around our site to see what makes us one of the most popular event and wedding companies in the Southwest including Devon, (Mid Devon, East Devon) Somerset, Dorset and Bristol covering Exeter, Plymouth, Taunton, Yeovil, Bristol Basically the whole of the West country. We supply chocolate fountains in Devon, Barnstaple, South Molton, Exeter, Exmouth, Cullompton, Willand, Okehampton, Newton Abbot, Paignton, Plymouth, Ashburton, Tavistock, Tiverton, Torbay, Torquay, Torridge, Torquay, Somerset, Wellington, Bridgewater, Minehead, Taunton, Yeovil, Bristol. The Devon Hotel, The Thistle Hotel, The Langstone Cliff Hotel, University Of Exeter, The Gypsy Hill Hotel, The Royal Clarence Hotel, The Grand Hotel, The Southgate Hotel, Exeter Golf & Country Club, The Victoria Hotel, The Buckrell Lodge, Bickleigh castle, Two Bridges, The Waie Inn,Fishponds House, The Southgate Hotel, The Holiday Inn, The Fox & Hounds Hotel, Powderham Castle, The Welcome Inn, The Exeter Arms Hotel, Stoodleigh Court, Padbrook Park, The Tiverton Hotel, Met Office,The Moorlinks Hotel, The Cleve Country House, Oake Manor Country Club. Make your wedding the sweetest. Perfect for a wedding, soiree or Party. Have the sweetest event in town.